Over the past 2 years we've been given 2 copies of the booklet, Sixty Five Years of Fine Printing at Carnegie—by Special Collections at Carnegie Mellon University and The Frick Collection. "Projets" were student projects produced at the Laboratory Press at Carnegie Tech University. The fine press printing program was the first of its kind in the U.S., started in 1922. A listing for the booklet on AbeBooks provided the following description. Decorative stiff wrappers which are made from "random printer's stock rules" preserved from the dedication of the Hunt Library in 1961. 32 pp overall. Numerous illustrations in the margins of fine printing from publications of the press. Three tip-ins, including press marks and a swatch of original paste paper done as part of the decorative papers experiments, 1987-88. In addition to a general history of the press and its equipment, topics include "The Birth of a Type - Hunt Roman," "The Laboratory Press and Porter Garnett," "School of Printing Management," "New Laboratory Press 1960-1964," and "Hunt Roman and Herman Zapf." Printed in offset by The New Image Press, Pittsburgh, on Mohawk Superfine paper. 8vo. One of the "illustrations" shown in the booklet was one of the student projets set in metal type in the shape of a vase. Turns out the piece was listed on eBay. Now it is ours. 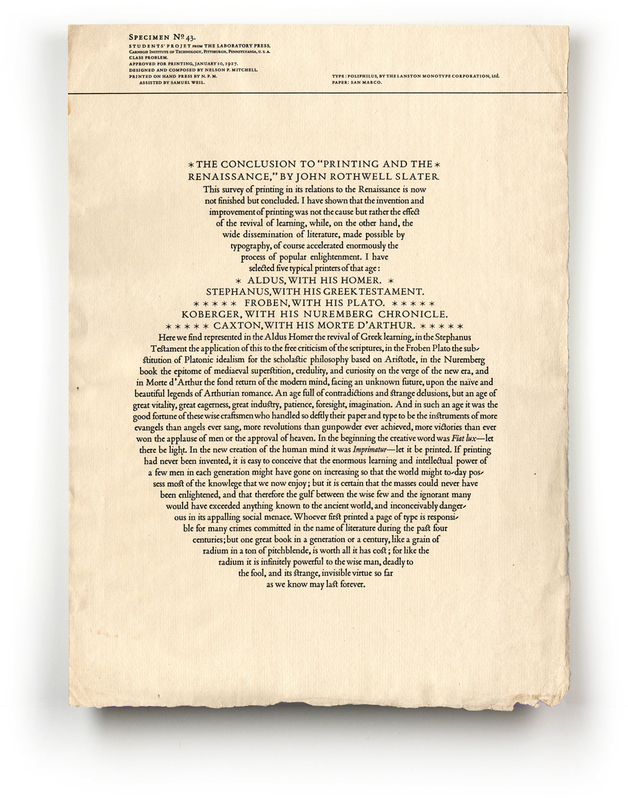 The unexpected part of this piece is how well executed the curve of the vase is. When you are holding the piece at an extreme angle in your hands, the curves are incredibly smooth. We aren't sure about exactly how these projets were produced. The typeface is listed as being from the Lanston Monotype Corporation with means the type might just have been made on a Monotype OR it might mean that the composition was assisted by being produced in-time on a Monotype caster. Second way is easier, though to get things to work out evenly at the bottom would take a serious amount of time and thinking about a group of students in class doing it doesn't seem very workable. Worth it to add a link to Projet No. 39 which we also possess. Really would be a killer project in a graphic design portfolio produced using a computer. It might cause students study the typography up close to get the curves to work correctly, even adjusting for a solid-sided letter like an "n" or an asymmetrical letter like an "f." Working on such a project even on a computer would let the student sneak up on the final solution. It would be interesting to give the same text to an entire class and see what they come up with. Then show this solution done with metal type. Hmmm. It seems reasonable that Mitchell could have adjusted the shape to work with the text (we believe Porter Garnett, the director of the program, supplied the text), The changes between u&lc and UC works quite well. The use of the asterisks adds an excellent sense of decoration that would likely exist on a Greek vase. It is worth considering that the type may have been produced using a Monotype caster to cast the lines in individual characters as it can compose the lines in very exact line lengths. The other option is that it is genuinely hand-composed using Monotype sorts. Getting the type to fit the contour at the bottom of the neck as well as at the bottom of the piece is well composed. Carnegie Institute of Technology, Pittsburgh, Pennsylvania, U.S.A. Printed on hand press by N.P.M. Type: Poliphilus, by The Langston Monotype Corporation, Ltd.